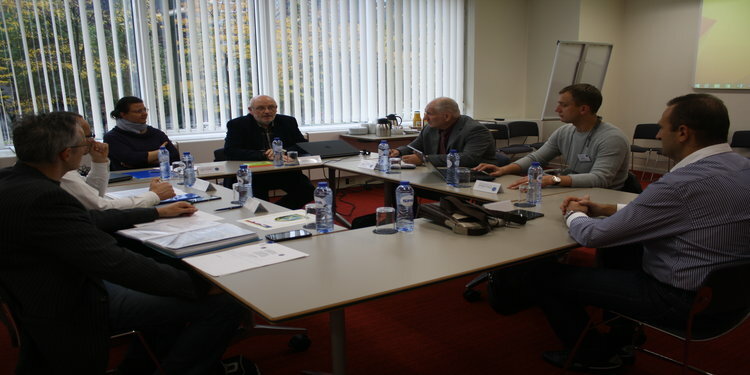 On 14 October 2015, EUROMIL organised, with the support of I. Costantini (Trainer, ETUI) a follow-up and closing session of the Training Session 2014-2015 for “younger and weaker associations” at the International Trade Union House in Brussels. This and other meetings took place in the framework of the 112th Presidium Meeting of EUROMIL. The seminar, targeted towards the youngest and weakest member associations from central and eastern Europe, builded on an initial pilot project in 2008 (Brussels) and the subsequent follow-on trainings in 2009 (Lisbon) and in 2010 (Berlin). The goal of the training was the transformation of military associations into trade unions – at least on the organisational level in case of a legal issue. After having met several times in 2014 and having received support and being trained on tools and methodology to develop their associations, delegates from HOSZ (Hungary), KTGC (Lithuania), LSA (Latvia) SOB (FYROM) and ZVSR (Slovakia) met for the last time on 14 October 2015 in Brussels to follow-up on the development of their respective associations and evaluate the use they made of the training. Should these associations still need further support, EUROMIL will of course continue to support them whenever needed.